Villa Encinas is a 2 bedroom, 2 bathroom countryside property with wonderful mountain views to enjoy from your private pool. It's located in the unspoilt area of Valtocado just 2 miles outside the splendid whitewashed mountain village of Mijas. A short drive will take you to a choice of cafes, bars, shops and restaurants, as well as the glorious beach at Fuengirola. Air conditioning/heating in all the bedrooms and WiFi are included. You'll love the splendid mountain views and beautifully decorated interiors. A great countryside escape for couples! The private pool is surrounded by paving and has scenic views - what better way to spend your holiday than with a cool drink taking in your surroundings. The villa is edged by terraces and gardens along its whole length. Some areas have seating and shade should you require respite from the sun. There is a covered terrace with a wooden table and chairs which is great for alfresco dining. A pathway edged with attractive trees and shrubs either side leads up to the front door. Your holiday starts here. There is parking space for one or two cars. The front door opens into the bright and airy open plan living area with beamed ceilings. It is furnished and decorated in a traditional manner with comfortable seating and a flat screen TV. To one side there is a dining table with chairs where you can enjoy a tasty meal. The fully equipped kitchen has all you need for preparing your holiday cuisine. There is also table and chairs, and a door leading out to the covered terrace and pool. There is 1 double bedroom with an en suite bathroom and 1 twin bedroom where you can enjoy mountain views. Both bedrooms are both comfortable, charming and furnished to a high standard. There is also a separate shower room. This villa has applied for a licence with the Junta de Andalucia and the application number is CTC 2016 84416. The licence number will follow. 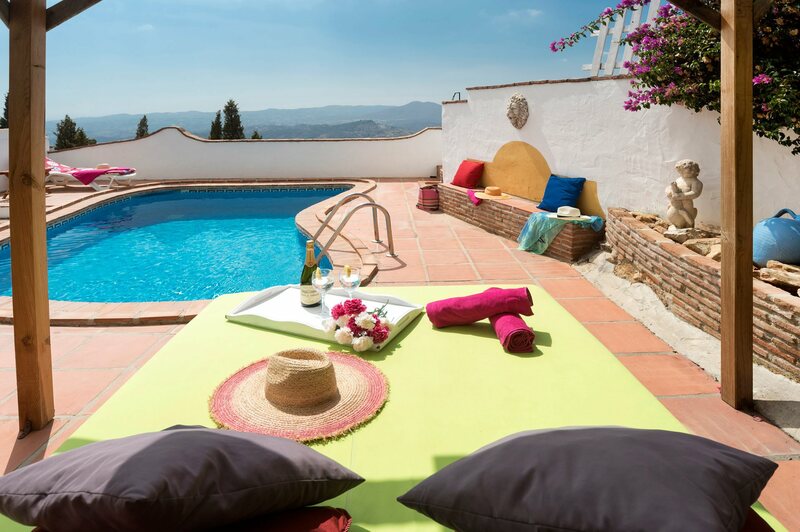 Villa Encinas is located in the scenic countryside of Voltocado near the whitewashed village of Mijas with its narrow cobbled streets, restaurants, bars and shops. The popular resort of Fuengirola with its long sandy beaches is around a 15 minutes' drive away. There is easy access to surrounding areas for you to explore, meaning you can get even more from your villa holiday. Mijas offers a variety of attractions within the town itself. These range from the tremendous views all the way down to the coast along to the wide variety of restaurants and craft shops to be found on the narrow cobbled streets. There are many village celebrations during the season together with the weekly market - an experience not to be missed. The nearby town of Fuengirola is a popular resort offering an array of facilities. It has own marina, great shopping in the little side streets, church squares for taking your morning coffee and all styles of restaurants to suit all pockets and tastes. The sandy beach at Fuengirola is just over 8 miles away and makes for a great day out. There is an incredible long stretch of beach front with an adjoining promenade along most of it. There is a range of outdoor activities available in or near Fuengirola ranging from the local water park in Fuengirola called Parque Aquatico to a variety of water sports on the beaches. Alternatively, the Bioparc Zoo is likely to appeal to many children amongst your party. Near Mijas and Fuengirola there are many well-known local golf courses to choose from, the closest being Mijas Golf, which has 2 courses. There are also tennis and horse riding facilities in the area. Villa Las Encinas is not available to book for season as it is sold out. Take a look here at the Costa del Sol villas that are currently on sale. The two courses at Mijas Golf, Los Olivos and Los Lagos are challenging enough to satisfy players of all levels. Los Olivos is surrounded by olive trees in an attractive setting is fairly level and not too difficult while Los Lagos is on more hilly terrain with water hazards and consequently more difficult. Mijas Golf is the venue of many tournaments and benefits too from the Luxury Byblos Hotel right next door – a perfect spot for a golfing weekend. Watch out for the 5th hole of Los Lagos, with an enormous lake to the right of the green and a curving freeway to the left. Address: Urbanizacion Mijas Golf, 29640 Fuengirola, Malaga Tel: 95 247 68 43 Fax: 95 246 79 43 Website: www.mijasgolf.org For golf bookings - Email: info@mijasgolf.org Description: Los Olivos 18 holes Par 70, 6009 meters Los Lagos 18 holes Par 70, 6348 meters Green Fees: 55 –61 – 67 euros Location: Exit N340 coast road at Fuengirola, Mijas Aquapark and follow signs. To Coin, exit at km 3. Every aspect of our holiday was very good. My only observation is that the property was further away from the town than anticipated, but the spectacular views made up for it. The owner of the property was very welcoming. The only contact with had with our rep was the welcome meeting but he was friendly and informative. Would definitely recommend Villa Plus to our friends. Villa Las Encinas was exactly what we were looking for. Private, not overlooked, with its own pool and toddler friendly. 5 minutes drive to Mijas and 15 minutes to Fuengirola.